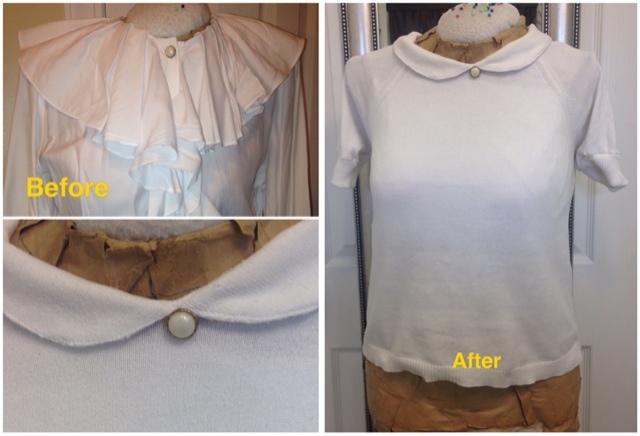 I have been wanting to do a white shirt with a Peter Pan collar shirt for awhile now. I had this fabulous shirt that had lots of material but after I prepared the collar, I ended up changing the neckline of the shirt which altered the entire thing and I couldn't save it. Luckily I had a white knit turtleneck sweater. I was so excited that I forgot to take a before photo. I was sort of successful with this attempt. I cut the sleeves and used the material for the collar. The only thing that I used from the original piece was the button. I still want to do a woven shirt and now I know how execute it. Sometimes failing is good. Cute after on the sweater! Can't wait to see your after on a woven shirt ;) Refashioning can be such a useful tool for learning and I've done my fair share by failing the first time around.